On Google maps when you are looking for a particular convenience – supermarket, nearest IKEA, petrol station – you are often faced with a chickenpox map of the area. Hover over these dots and you will get a very short synopsis of the place – name , number of Google reviews, maybe a ‘star’ rating and a few bullet points of detail. Quite often this information is utterly useless (you’d feel pretty safe in making an assumption about what a petrol station might sell). But when it comes to pubs, this three second hover can be the difference between a ‘pint at a push’ or moving the mouse elsewhere. Odd, but concise. And you definitely know to avoid the Marlborough Arms and to head to the Fox Craft on that odd occasion when you fancy a Doom Bar and some stinky fish. 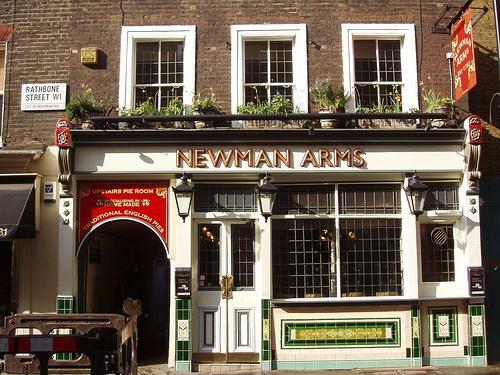 Whilst the ground floor of the Newman Arms concentrates on being a pub – and a ruddy nice one at that – the top floor is the designated ‘Pie Room’ (so 50% pie?). And we’re talking proper pies as well, not lies*. *For those not familiar with the difference. A meat pie has pastry all the way around – top, bottom and side. A meat lie is usually found in a ceramic bowl and just has a puff pastry top. This is not a pie. This is a lie.